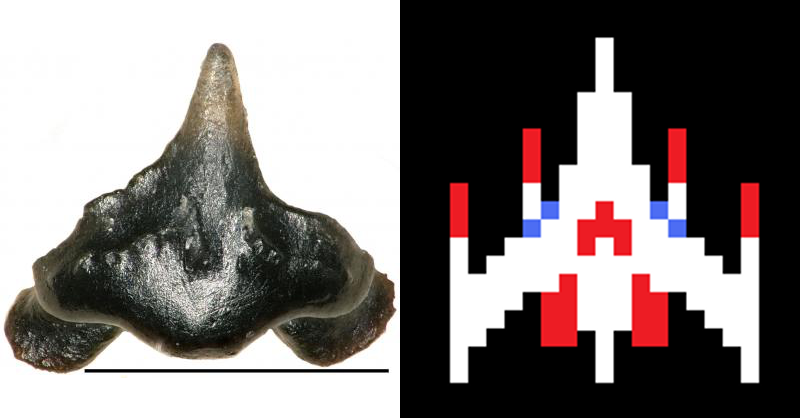 A newly described freshwater shark from the Cretaceous Period had teeth that resembled the iconic Galaga video game spacefighter. Remarkably, the remains of this shark were found in the same pile of debris that contained Sue the T. rex – the largest and most complete fossil of the species ever found. Introducing Galagadon nordquistae, a newly discovered freshwater shark that swam in the Cretaceous rivers of South Dakota some 67 million years ago. It wasn’t very big, measuring around 12 to 18 inches in length, and it likely scoured the riverbed in search of small fish, snails, and crayfish, according to new research published today in the Journal of Paleontology. The scientists who discovered Galagadon said the shark is related to modern-day carpet sharks, the oddly shaped wobbegong shark being a good example. All that’s left of Galagadon are two dozen tiny teeth, which were found in the same sediment that yielded Sue, the famous T. rex skeleton. The remains of this fearsome tyrannosaurus were uncovered 20 years ago in the Hell Creek Formation of South Dakota. Smartly, the leftover sediment from this work, called the matrix, wasn’t thrown away, and was instead stored at the Field Museum in Chicago for safekeeping. Recently, a team of scientists and volunteers decided to take a second look at this two-ton pile of dirt in hopes of finding some fossils – which turned out to be a good idea. As noted, only the teeth of Galagadon remain. Its other body parts are long gone, mostly because cartilage doesn’t preserve very well. 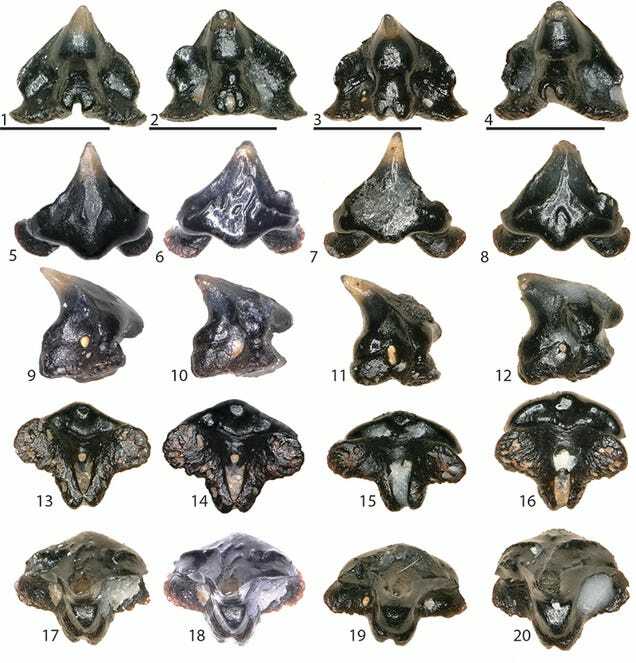 Palaeontologist Terry Gates, the lead author of the new study and a lecturer at North Carolina State University, and his colleagues inferred the size, shape, and behaviour of Galagadon by comparing its teeth to those of similar shark species, both extinct and extant. Galagadon’s teeth are less than a millimetre across, so they could’ve been easily overlooked. Nordquist was struck by the shape of these teeth, which reminded her of the spaceships in Galaga. Her colleagues appreciated the comparison, and they decided to name the shark after the classic video game and Nordquist herself. Galagadon and T. Rex, as this finding suggests, were contemporaries. The discovery of a freshwater shark in this part of the world, however, is challenging conventional thinking about the environment in South Dakota at the time. Sue, it was thought, lived and died near a lake that formed from an evaporating river, but the presence of Galagadon suggests the region was connected to the sea, likely by a river, allowing sea-based sharks to move inland and evolve a capacity to live in freshwater.